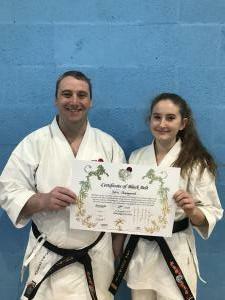 Junsui Shotokan Karate Do held a Black Belt grading on the 18th November 2018 with Laura Wilson and Sarah-Jayne Sams attempting their 2nd Dan and Rachel Osbaldestin training for her Shodan-Ho. All candidates did fantastic working through the tough criteria laid out in the syllabus to test not only physical and technical ability but their mental ability too. The grading lasted just short of 4 hours the 2nd Dan candidates where they displayed a high standard of Karate with a no quit attitude. Working their way through some complicated combinations and displaying their application of Kata as well as sparring ability. 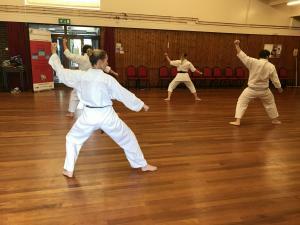 For the 2nd Dan candidates taking on multiple opponents at once over a 10 minute period, whilst all their fellow karateka supporting them through it. Rachel became the youngest and highest grade of all time at JSKD at just 10 years old with her now starting training towards her 1st Dan, Rachel has an unbelievable talent and we all look forward to what she achieves in the future. She handles everything the club has thrown at her since starting 5 year ago. 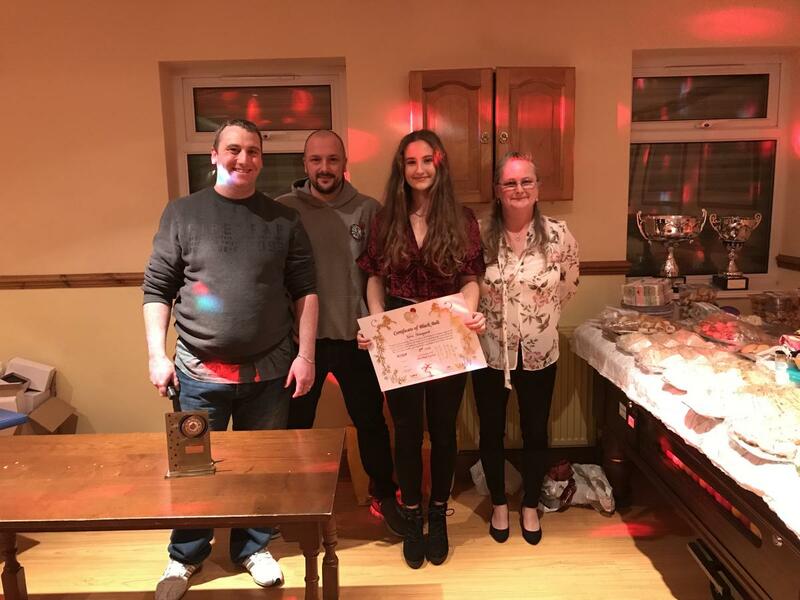 Sarah-Jayne joined just 1 year ago after a break from Karate and soon got back into the swing of Karate and started to pick up the pieces she already knew. Growing at the club over the year and attending a course over a weekend in Bridlington, Sarah-Jayne soon became part of the family and pushed on to hit the target set of November. 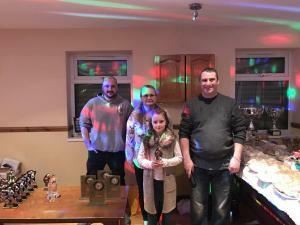 Laura also joined at the same time after moving from Scotland due to work. 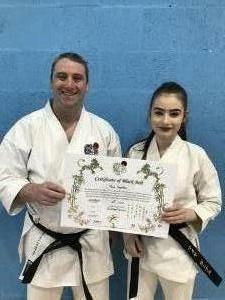 Laura again had to adapt to our syllabus and way of training but showed great determination also to do so. After a little push and date setting Laura too was committed to training for 2nd Dan. 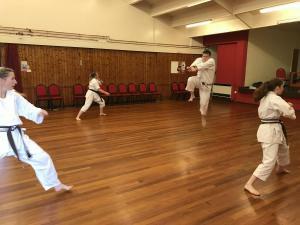 With a mass entry of Kata to add to her knowledge base the training really started. A big push and a few extra sessions were added into the training to ensure they were ready for the day, both are massive asset to the club and we look forward to what they can bring to JSKD in the future. Both had to write an essay for the grading, both were very good and I felt the emotion within. They have agreed to share, Sarah-Jayne's can be found here and Laura's here. Well done all we are so proud. It is great to be able to prove we excel at what we do at JSKD and can meet the criteria set. Well done all we are so proud to have achieved this award. 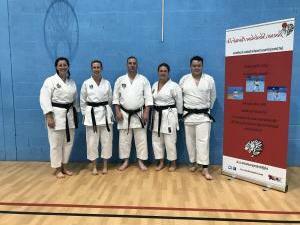 Junsui Shotokan Karate Do will be opening a new class at Kirk Merrington Primary School ran by Assistant instructor Sarah Bell. This will be an after school class and available to school students only. Willington JSKD reopened again last week and the first 2 class have gone really well under the instruction of Sarah-Jayne Sams. Sarah-Jayne has also recently passed her level 1 instructor qualification. 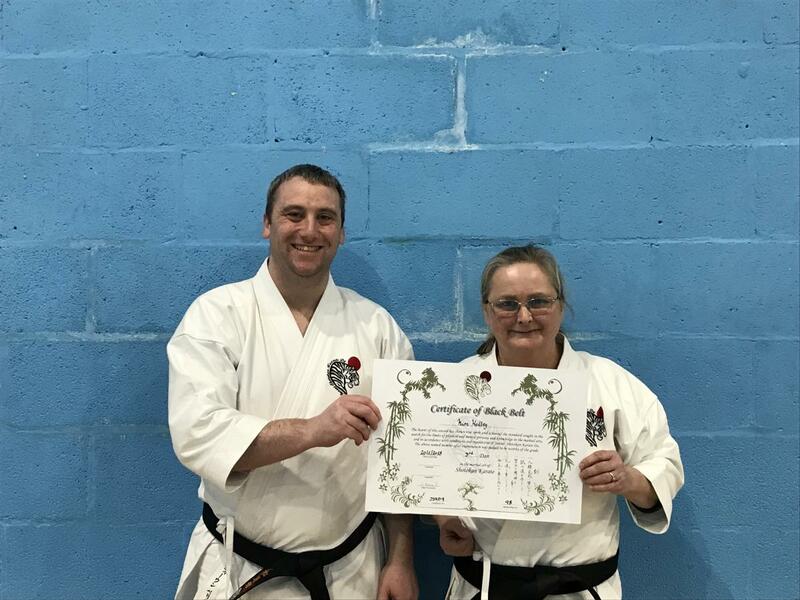 Next up for Sarah-Jayne is her 2nd Dan grading in November! Junsui Shotokan Karate Do will be hosting a Iain Abernethy seminar on the 26th January 2019, the seminar will be on the use of the Heian (Pinan) Series in modern day self-defence. The seminar is for 18 years + and will cost £30 and is open with places given to JSKD members first. 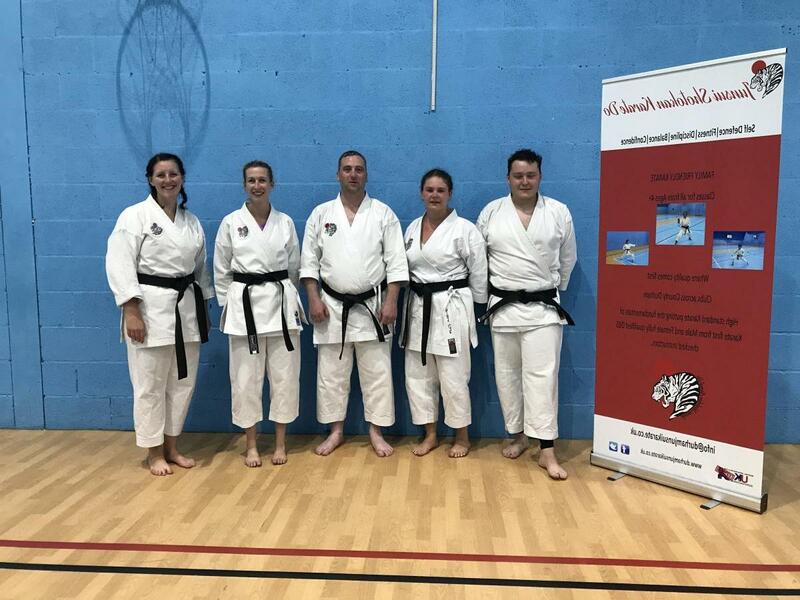 On the 9th July 2018 we held our largest Black Belt grading yet with a change to the physical grading taking place all on one day. All 4 candidates had already completed their teaching exam a couple of week prior. 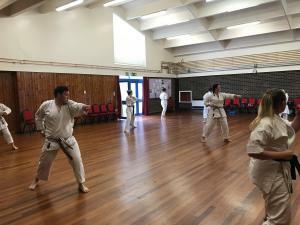 The grading started at Pittington Village Hall at 2pm and concluded at our Belmont Dojo at 6:30pm. Each candidate completed all the kihon (basic combinations) required, All Kata 14 in total with some Kata required more than once, 5 step kumite, 3 step kumite and 1 step kumite, Bunkai and Oyo of Kata and finally 10 minute sparring with multiple opponents. All candidates kept going throughout in a very hot environment due to the glorious weather we have had, when the going got tough their fellow karateka encouraged them onwards showing the unity at the club. Sarah Bell became the 4th ever 1st Dan at JSKD from White Belt, with Jack Strangward following up to be the 5th and Charlotte Hedley the 6th. 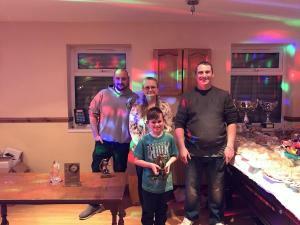 Fiona Kinghorn Jones was also awarded her 1st Dan who completed her journey after starting Karate at 10 years old and taking it back up after joining with her children. 2018 has been a big year so far with 5 new 1st Dan's already showing the hard work the instructors and students are putting into training and developing at the club. We look forward to welcoming more new Dan grades later in the year with a couple of students who are training towards 2nd Dan and many more training towards 1st Dan in early 2019! 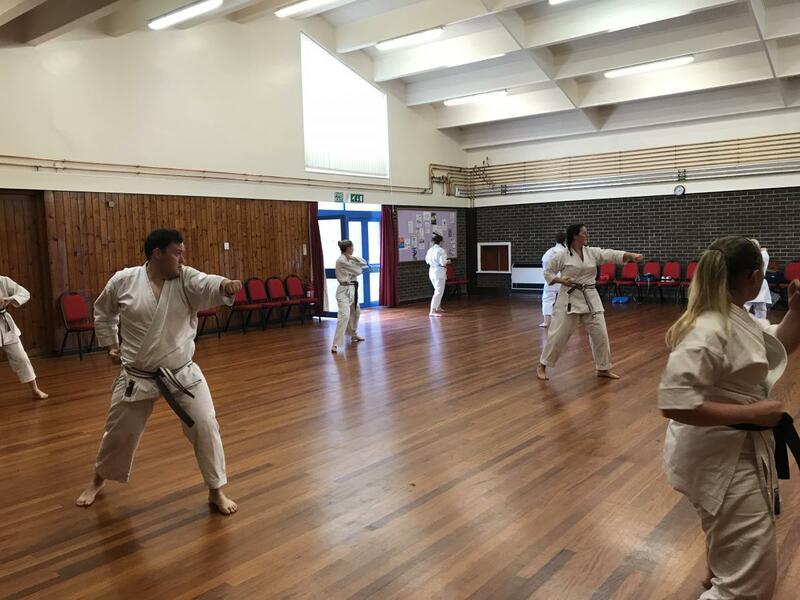 Junsui Shotokan Karate Do will be offering a little tigers class at our Willington Dojo, the class will be Wednesday and start at 6pm for 30 minutes as an initial trial to gauge interest with the option of extending longer if the demand is required. The first class will take place 2nd May 2018. First 2 classes will be free as usual and the class will cost just £1.50 for the 1/2 hour class. On the 20th January 2018 at the annual awards presentation Mia Gamble and Katie Strangward were presented with their Black Belt Certificates after completing their gradings. 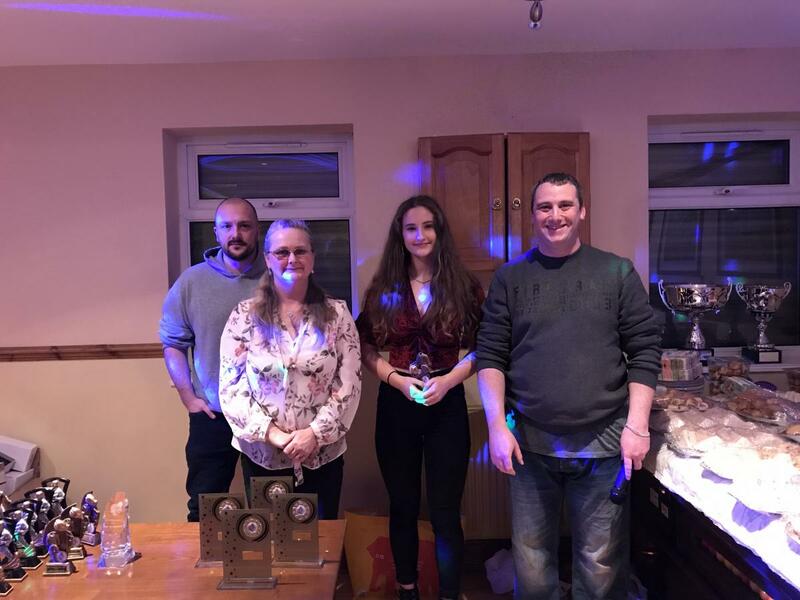 Also presented with the grade of 3rd Dan was Kim Hedley, her service to the club and the community and the hard work she puts into the clubs made this an easy award to grant to a hard working Instructor. The club has some fantastic black belts which all have the same passion to drive the club forward, I look forward to more Black Belts been awarded this year and improving the already good standard of Karateka at the club.